I have been obsessed with teeth whitening for the last couple of years. I first had my teeth whitening through my Dentist three years ago due to having Enamel Hypoplasia which left my teeth to be blotchy and discoloured, and teeth whitening did initially solve this problem. The Dentist suggested I used Opalesence Whitening Gels on specially made trays for three months until the look of my teeth improved. These products did work wonders, however the upkeep became very expensive with each whitening tube costing £25 and lasted for 3 uses. Earlier this year I found out about the brand Instant WhitesTM and saw that they recently released a new product called the Coco Bright White Light Activated Teeth Whitening Kit. The Teeth Whitening system is said to to leave your teeth feeling cleaner and up to 8 shaded whiter without the use of peroxide. 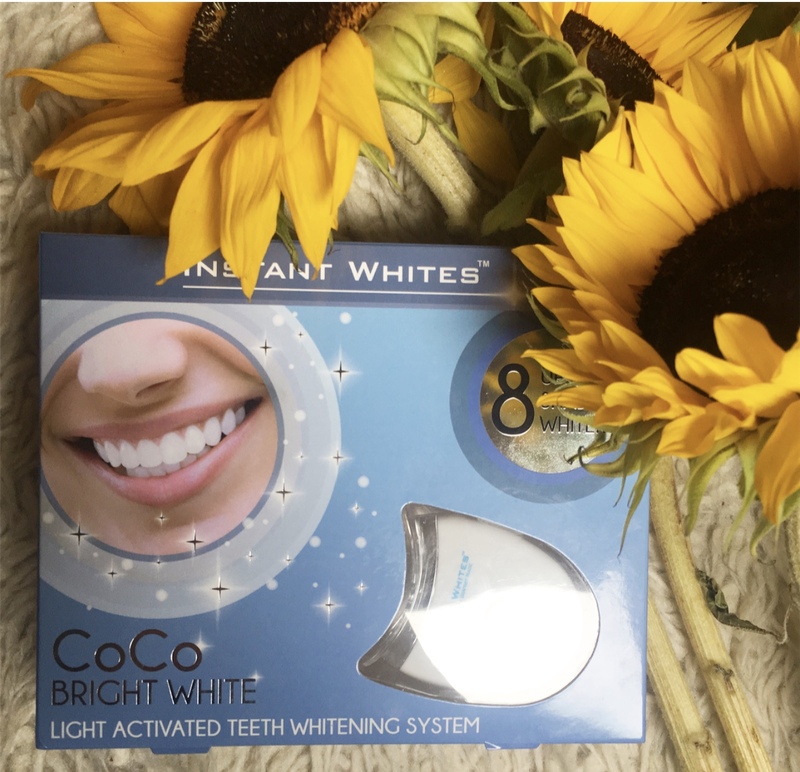 The formula is a safe and effective light activated coconut based formula which delivers faster teeth whitening results whilst being in the comfort of your own home. The system is specially formulated by clinical dentists and has also been used for Dentist Teeth Whitening. The mini light activates the whitening gel delivering clinically proven results of up to 8 shades lighter in just 7 applications.The dental and clinical team behind the brand are recognized as one of the world’s foremost experts on teeth whitening & dental health, working with the world’s largest oral care companies such as Colgate-Palmolive, Church & Dwight. After finding out more about the brands ethos and how the Teeth Whitening system works I was convinced it would be a better and more affordable alternative to try as the mini-light technology offers faster teeth whitening acceleration by targeting stubborn embedded stains. Further down the post I have have posted a picture that shows the results after using for a just a week, I am very impressed! To activate the mini accelerator light remove the plastic shield from under the batteries, but first brush, floss and dry the teeth before applying. Attach the dual mouth tray to the mini accelerator light, then attach one of the applicator tips to the gel syringe. Apply a small line of the whitening gel to each inner wall of the mouth tray, focusing more on the front 6-8 teeth as they are most likely to be seen when you smile. Make sure you don't overfill, I have a tendency to do this! Switch the mini accelerator light on and place the filled tray directly against teeth. Hold in place with your lips for 30 minutes a day. I potter about the house or watch TV whilst I do this. Finally rise your mouth and tray with warm water after every use. 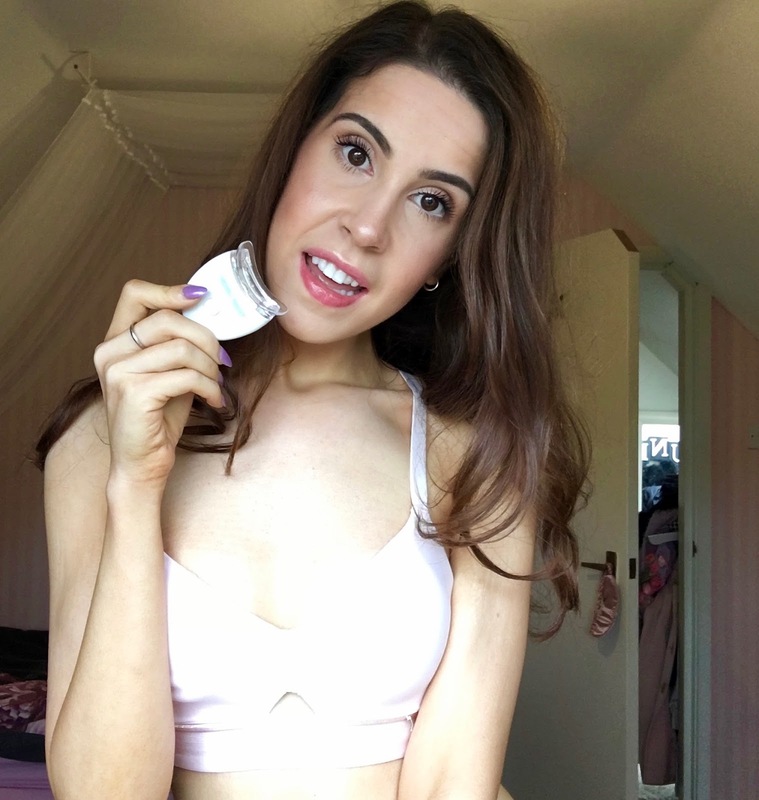 Overall I am really happy with the Teeth Whitening Kit, my teeth look much whiter after one week, so great for special occasions or to give you a brighter smile. The kit is so easier to use, no awkward long wait or unpleasant after taste. I also haven't experienced any sensitivity or discomfort, so a massive thumbs up from me! At the moment the Light Activated Kit can be purchased on the Instant Whites website and is on sale for the incredible price of £19.99. Have any of you guys tried Instant Whites out? I'd love to hear your experiences with teeth whitening. Feeling self-conscious about your teeth is rubbish, don't feel like you have to hide your beautiful smiles away! P.S: I am doing a giveaway of this box through my Instagram, go have a look at the post and follow the steps to be in with a chance of winning! Hello! Pleasant stuff, do update me as often as possible when you post again something like this!